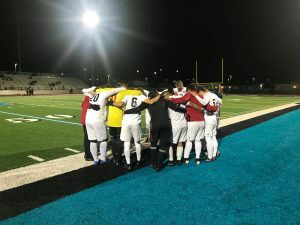 CORONA: King went on the road to Santiago High School to put a wrap on what was a foregone conclusion: The 2019 League Title. It is the second title for King in the last three seasons. They did just that with a 1-0 victory. Hunter Brown did the duties getting the sole point on the board, hitting the net from about 35 yards out. But the dual King keepers Luca Sciommeri and Bryan Shihad did what they’ve done all along to the 8-0-2 Big 8 season record, playing stingy in the goal. Their defense is as much of the story this season as the scoring exploits of Brown, Padilla and others. Since it was the last league game of the season, Mapes started all of the seniors. The night before he hosted a spaghetti dinner at his home in Riverside. 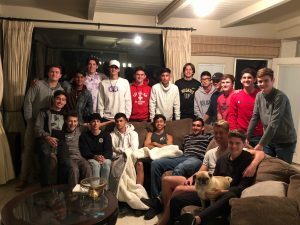 “It was a good time to bond as a team and to celebrate our league championship at the house” Mapes said. The CIF Playoffs begin next Thursday, at King High.